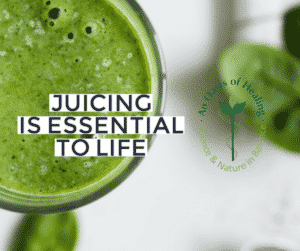 Juice Feasting is essential to life and maintaining optimal health. All animals fast when they are sick. You may notice that when you get sick, usually you don’t feel like eating. This is nature’s cure …not man’s cure. Approximately 60% of your immune system is either a part of or next to your gastrointestinal system. Therefore, fasting allows your digestive tract to rest and heal. Since your body is not using its energy to digest and eliminating newly ingested toxins from the system, it is able to direct all its energy toward getting rid of the toxins it has already accumulate. Fasting for short periods of time such as seven to ten days is considered completely safe by most fasting experts. Juice feasting is truly a powerful tool for healing.